Both these were done in light tan, which is a first for the French figures. As well as these sprues there are a great many figures that are not to be found anywhere else. The following is an inventory of these. Perhaps the most important figures are the knights. As can be seen, there are four of them, all with different but splendid crests. However if they are well endowed on top then they certainly are not below, as their torsos slot in to the peg on the horse to create the finished model as seen below. All are really nice, although at an average of 25 to 26mm in height for the men they are too tall for the advertised scale. Finally the set includes a couple of worthwhile accessories. One is the dividing rail, the tilt or tilt barrier, between the participants, which is in three sections, and the other is a very nice grandstand. The stand might take 10 people seated, so hardly Wembley Stadium, but it is a simple and attractive model. This set appeared some time after the tournament set and shares many of the same components. 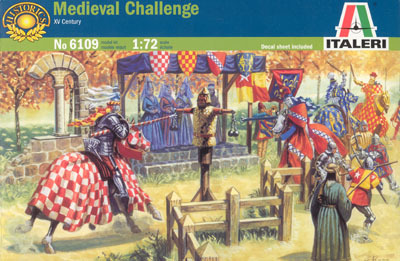 Some however are new so may also be of interest to fans of medieval history. To begin with we will state what this set does NOT contain. 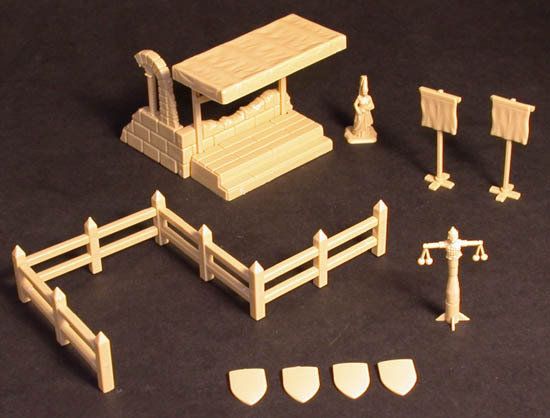 It is missing the two sets of Hundred Years War soft plastic figures that were included in the first set, and it is also missing the grandstand and fencing pictured above. What it does share with the first set is the four mounted knights and the officials, servants and ladies - again one of each. In addition it contains a small number of new items as pictured below. Perhaps the main item is the shelter, set into what seems like part of a ruined church. Why a tournament might be held amongst ruins we do not know, but the construction, that only slightly resembles a medieval bus stop, is supported by the ruined walls as shown. A much simpler affair than the previous grandstand, but perfectly reasonable nevertheless. The fencing comes in four identical sections which slot together as shown (plus an extra end post). This arrangement is the only one possible with these pieces, although by drilling or trimming the enterprising modeller could force something different if desired. On the right can be seen a couple of nice banners and in front of them a quintain. 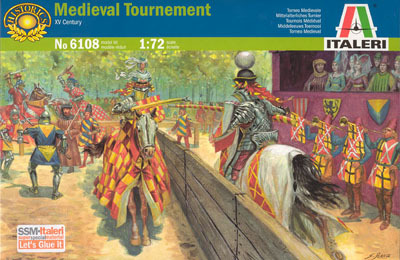 A quintain could come in various forms but the basic principle was that a knight struck a target (usually a shield) which caused the device to swivel, bashing the knight with a heavy object if he did not ride fast enough to get out of the way. The sculptor of this one has clearly seen an illustration, and knows that they often took the form of a 'saracen', but has completely misunderstood the purpose of the device and has given it sand filled bags on both arms, making it completely useless. Surely Italeri could have managed to explain the purpose of this device, but they did not and the result is a ridiculous and useless object. In front of the quintain are a number of shields which the instructions tell us could be used to decorate the roof of the shelter. While they are much too large as normal shields perhaps one could be used to make the quintain something useful instead! Finally there are a small number of water-transfer decals of basic heraldic devices to decorate the shields and banners. The parts are crisply done and fit reasonably well. Had it been done properly the quintain would have been the most useful item in this box, but as it is everything else is of some value. Our photo includes one of the over-sized lady figures to give an impression of relative size, although none of the new components are size-critical.